This one went surprisingly fast, smooth and easy. The whole process of creation and endorsement took only one day. The task was to create a simple, good-looking, modern logo for an art holding company, without going to great conceptual lengths. I was given only a couple of days, so I had a certain skepticism regarding the quality of the final product. But fortunately, my worst expectations proved to be wrong: the logo came out neat and solid. It surely was no world-beater, but the client was happy with the product, which was quite enough for me, considering the circumstances. 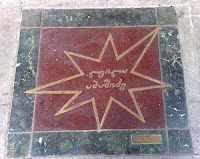 Originally the client wanted to use an eight-pointed star as the leading element of the design, because it was a trademark of their related project: the Hollywood-style memorial stars to honor the famous Georgian actors. I expressed a strong concern that such an element could give the logo somewhat cheesy looks, but still promised to work on that concept. And I did: on the right you can see one of the several demos where I used the suggested element. Fortunately, these "star" versions were rejected in favor of a more modern concept, just as I hoped. გიჭირთ ონლაინ კრედიტორის არჩევა? დაგეხმარებათ სერვისი https://sesxebi365.com/company/ccloan, აირჩიეთ საუკეთესო საკრედიტო პირობები და გააფორმეთ თქვენთვის ყველაზე ხელსაყრელი კრედიტი.